Home Nostalgia Gaming	Have you played…Freedom Fighters? You know that moment when you – out of the blue, for some inexplicable reason – you remember a game you used to play a long time ago and have enjoyed immensely? As I was recently going through my old collection (which is both old and rather large) my eye caught the title Freedom Fighters. 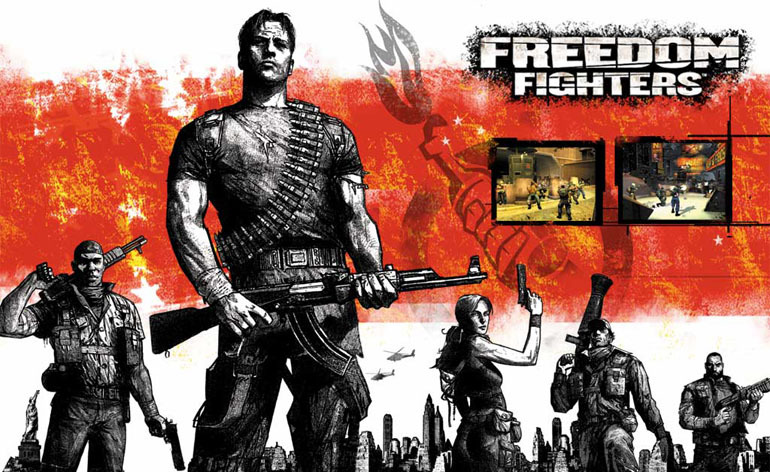 Freedom Fighters was developed by IO Interactive which is famous for its Hitman games, and even though the developers themselves have been talking about the sequel (the game was quite well received at the time, getting ratings between 85 and 90% in average) that never came to pass. But even as it was at the time, and even though it was originally designed as a turn-based game, Freedom Fighters proved its worth as an action game. As a third person shooter with the shoulder aiming ability for more precise shooting, you would be hoping one part of the city to another using sewers (geee, swell, you’ll have to share with Teenage Mutant Ninja Turtles) to exit exactly there were the pesky Red Army oppressors expected you the least. Sometimes blowing up a gas tank in one area would affect the other area, so a bit of strategic thinking is nothing to scoff about. In the breaks between missions you get to visit the main underground (sewer!!!) base, where you could restock with ammo and decide which section of the city to attack. Enough talk – here is the video. Let me know what you are thinking in the comments below either on the YouTube channel or here on the website. Cheers! UPDATE: Unfortunately I couldn’t capture the gameplay neither with FRAPS nor with Action! Mirilis, so there won’t be a video. Always a possibility when dealing with the old games, I’m afraid. Well, it is still fun, but somewhat clunky… It was actually designed on the Hitman 2: Silent Assassin slightly altered engine, but it hasn’t aged as well as I hoped. I have played it for barely 20 minutes and I had to give it a pass. Yeah, I recall that it was a great game back in the day, but it hasn’t aged all that well. The graphic is far too simple to be satisfactory, the AI is lacking, settings are truly unrealistic and it simply didn’t have that epic feel that many games of the time and age still do have. The good old games we reach back to fall into two categories; one is where we remember the fun times but we can’t relieve it (since the quality of the games for our present needs is far too unsatisfactory) and the other, where the true gems belong to, are the games we remember off fondly and which still manage to entertain us and provide us with joy of gaming. Freedom Fighters sadly does not belong to the second category. It was a good game, but now the time has left it behind for good. PS It could be worth noting that IO Interactive has mentioned several times, both on their own and when asked by the journalists, that they would like to make the sequel to Freedom Fighters. Sadly, some other “stuff” happened to be in the way at least twice now; first time it was the development of Kane & Lynch, second time he development of Hitman: Absolution. Maybe now the time is right for the sequel? World of Warcraft: Legion expansion – are you hyped?